Last week I had the chance to fly to Paris to attend a very special event hosted by Dyson to present in details their Supersonic hair dryers. As you already know, I am a big fan of the brand ! These hair dryers truly work pure magic on my hair, they are powerful which is very important since I have a LOT of hair and also quite silent which is also very appreciated because you know the deal.. you kinda tend to get sick and tired of the noise when you have to blow-dry your hair during 20mins. You know now that I choose very carefully with which brand I am going to work because I know that a lot of you rely on me when it comes to reviews, advices etc.. I would never be able to tell you about a products and/or a brand in which I don't believe. We "influencers"/bloggers/Instagrammers don't willingly talk about our collaborations since it seems be such a polemical topic.. This doesn't scare me at all because I know how I am working and I have nothing to hide. Me and my team prefer to pass on so many daily job offers just because I don't feel like promoting these structures or products, because I know I gained your trust and this means a lot to me, so thank you again guys ! I'm so glad to be able to work with the amazing brand that is Dyson, they are always working hard on improving not only esthetically but also scientifically and technically the devices we use in our daily lives. Working with them allows me to discover more about their universe and this is something I'm so happy to share with you ! Back to the hair dryer: I didn't know much about the technology that was hidden inside this cute and practical device, all I basically knew was that it looked really nice, that it is practical and effective. Did I say not much ? Well there's a LOT more than that ! The technology and the researches that were necessary to obtain such a great result are absolutely mind-blowing. I am always impressed by all the "behind the scenes" experiences, all the work that is required to get somewhere satisfying, it is simply amazing. We got to discover all the prototypes, the previous versions and different stages of the hair dryer, all of them helped to lead to the one we can actually buy at the moment. Just so you know, 600 prototypes and 4 years of hard work were necessary before they could get to the final version ! We also got so many explanations about the hair itself: how it gets damaged by daily styling and how exactly the hair's fiber gets deteriorated when you over-heat it which was really interesting for me since I am a huge hair styling lover.. I can tell you this really encourages you to use only good products and devices on your hair ! What's the actual difference ? 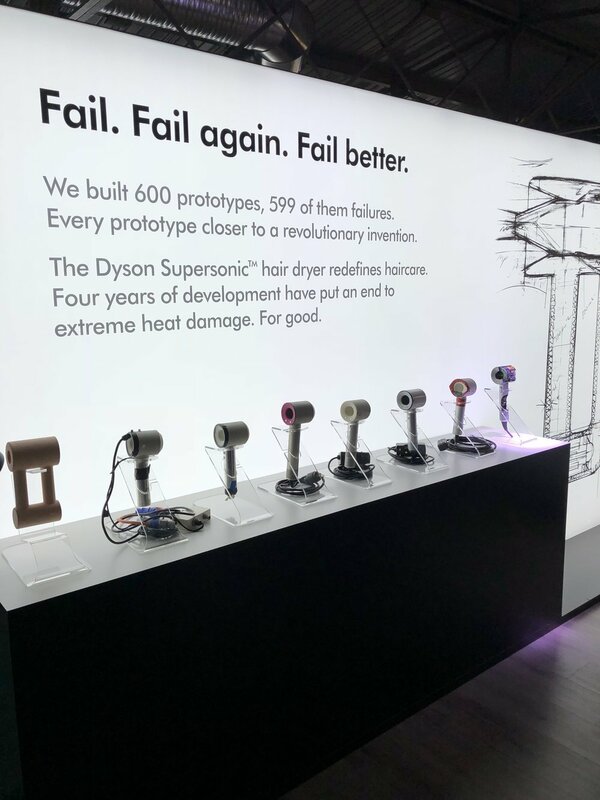 Dyson's Supersonic hair dryer dries your hair without damaging it by not heating your hair too much which destroys its protection layers but also fast enough to not over solicit it. The Supersonic has a heat control device that checks the temperature 20 times per second which is so impressive ! This way the hair dryer does not blow over-heated air on to your hair (this was a tricky one eheh). Now you know that when you buy a Dyson Supersonic you don't only buy a nice looking and trendy device but also a little wonder which incorporates so many scientific improvements, this is really important to know since this product has a certain price but when you know everything about it, it makes so much more sense. The view from the event's location was SO beautiful ! I just had to take some pictures for my Instagram, I LOVE a nice view and obviously a nice view from Paris makes it even better. I always feel at home when I'm there it makes me happy and joyful even if it is rainy. Can you guys spot the teeny tiny Eiffel tower in the back ? 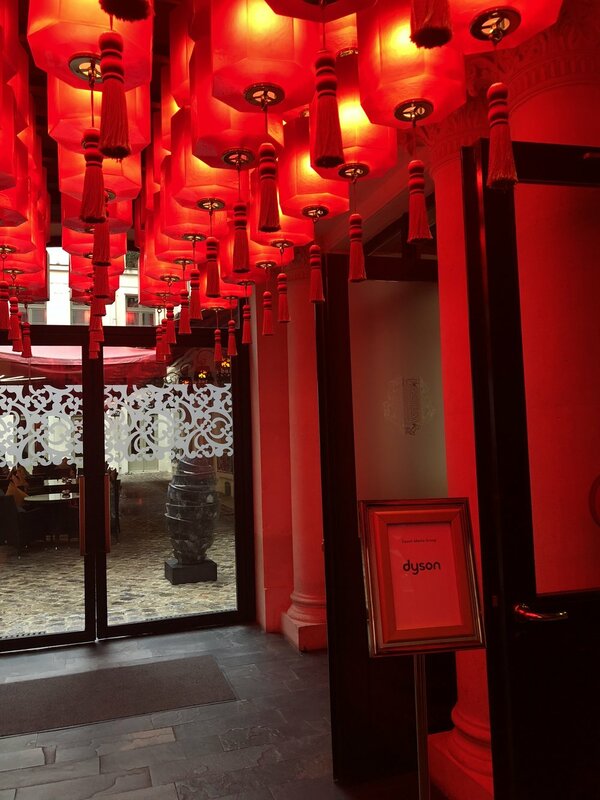 I also got to discover another hotel in Paris which I heard a lot about but never actually visited: the Buddha Bar Hotel ! You know me guys, I'm such a big fan of hotels, architecture etc.. So I always love to end up somewhere new and be able to come upon new experiences. Now not only can I tell you that I loved the whole oriental theme but also that they have Dyson hair dryers available in each room of the hotel which is a BIG positive point since I think it finally cuts out the old poor hotel hair dryers kind of tradition that was going on. I had a hair stylist coming to my room on Tuesday evening to style my hair before the evening. I loved the bouncy curls we created, it gave my hair so much volume ! We had little time on Wednesday morning before our flights so I used it to go take some Instagrammable pictures, professional deformation I guess ;) It was rainy and gloomy as hell unfortunately but hey a little photoshop never hurt nobody ! And just like that, we made the sky blue again eheh. Did you realize Valentine's day way just around the corner ? Time flies ! 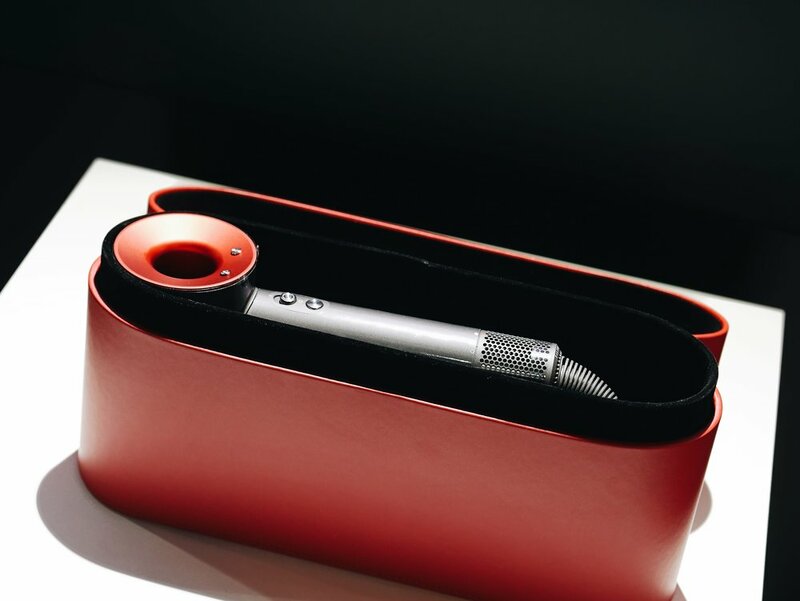 This is the Valentine's Day special Dyson edition and it looks SO gorgeous, it makes the perfect gift for your lovie, your mommy (am I the only one to give gifts to my mom on V-day ? ), your friend etc.. And the box it comes in is also so pretty, this is what I love about the brand, everything is so well done! From the packaging to the device itself.